Fresh topiary plants are the perfect thing to brighten up any living room. 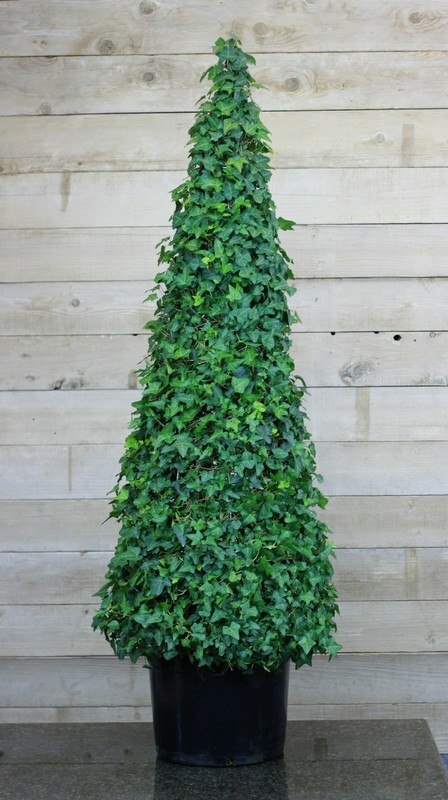 With their verdant colors and impressive versatility, an ivy cone topiary fits well within the home's interior. These beautiful plants are simple to grow and have a weight of 22.75 pounds. These tall plants do best with indirect light, so they should never be planted in the bright sun. If live topiary trees are over-watered, the roots end up rotting. To prevent this from occurring, the top inch of the soil should be allowed to dry out before the fresh topiary plant is watered again. It flourishes the most in temperatures of 40° to 80° F, so the topiary should only be placed outside when the temperature is mild. If nighttime temperatures are lower than 40° F, it should be brought back into the house. For the best results, the fresh topiary trees should be misted once or twice a week with a spray bottle. The extra humidity is required by the plant for it to thrive. In addition, dust should be brushed off of the leaves. By doing this, the owner can prevent spider mites from developing. Live topiary trees were first used by the ancient Romans. Although they fell out of style until the Renaissance, they have enjoyed a resurgence in popularity over the last few decades. In the United States, portable topiary plants first developed in Disneyland. Walt Disney decided that the cartoon characters that were portrayed on television should also be recreated in plants. The landscape shrubbery used steel frames to help train the topiary plants to grow the correct way. As the fresh topiary plants grew, they filled in the frame and were used throughout the various Disney theme parks. More recently, topiaries have debuted at the Olympic games. In 2008, impressive displays of topiary plants were incorporated into the summer Olympics in Beijing. Topiaries have also retained a popularity inside of residential homes, greenhouses and landscaping. For a green addition to any household, an ivy topiary is one of the best selections. It can be pruned and modified to produce different shapes, or it can continue to grow in the way that it is sold. Boasting of many design options, these plants are one of the most customizable landscaping options available today. Easy to care for, they are a beautiful addition to an interior room or any living area. Hi, I got 5 of these cone topiaries for my landscape project and just got 4 more. These hold up well outside.